A watch which captures the mystery and mankind’s endless fascination of both space and time, the astonishing Louis Moinet Sideralis Evo in polished 18Kt rose gold is a piece which transports its owner on an epic journey into another world where planets can be seen as they pass by, and the essence and movement of time fill its expanse. Before rockets could carry us out of and away from our own little place in the universe, the great unknown of space has always had a powerful pull on the collective imagination of mankind, and ever since the earliest horologers taught themselves how to relay and display the passage of time on a mechanical instrument, what happens far above us in space has continuously presented a challenge to watchmakers as they strive to replicate in miniature the wonders of our solar system. Louis Moinet, inventor of the chronograph and one of the great horologic pioneers was also fascinated by astronomy, and two centuries on from his time, his name still adorns some of the most exceptional timepieces today. Featuring double inverted tourbillons and two rotating discs via which the sidereal seconds and the planets are displayed, the Louis Moinet Sideralis Evo is a truly spectacular piece indeed. It is encased in an imposing 47. 4mm rose gold case, with sculpted, hollowed lugs and screwed bezel. 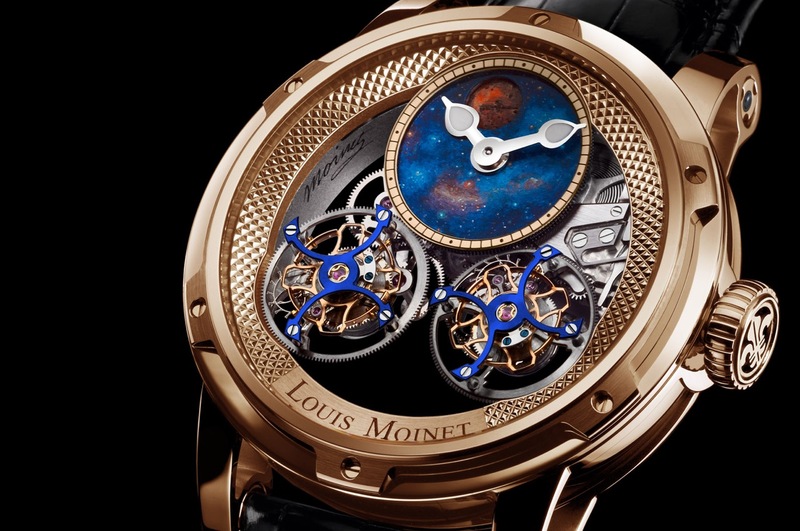 Between the upper and lower sapphires, the centre is almost empty, except for the two grand tourbillons, which dominate the lower portion of the dial area, and appear to be floating in suspended isolation, so creating a mesmerising mechanical animation as they rotate counter to each other in opposite directions. Uniquely, the rotation of the double tourbillons drives the two moving elements of the sidereal complication, so the dial, with its photorealistic spacescape of the cosmos is constantly rotating anticlockwise, above another disc of aventurine, on which the moon, mars and mercury are hand painted and feature actual dust particles from each, recovered from meteorites which have been hurtling through space for billions of years. A round aperture in the upper disc reveals each one individually, passing underneath as the two parts counter rotate. It is a fascinating sight, and above this stunning feature, short ornate hands with luminous tips indicate hours and minutes onto a silvered chapter ring. On the underside, the skeletonised plates and bridges reveal the superb hand finishing of the manual winding double tourbillon movement within. Beating at 21’600vph it will run for 48 hours between windings. A watch of extraordinary complexity and exquisite execution, the Louis Moinet Sideralis is a piece for the discerning collector, and a mere twelve examples have been manufactured. This horologic masterpiece is presented on an alligator leather strap with 18Kt rose gold folding clasp.